It is easy to blame the psychology major in me but I recognize that my desire to understand and study human thinking and behaviors goes back a long way. I have spent time reflecting and examining my childhood choices and wondering about my motivations for decisions I made. When it comes to safety I know it all started with how I was taught by my grandmother. Never leaning over the edge of the banister, always taking one step at a time, walking instead of running, holding hands anywhere we walked, watching instead of doing. As a parent and as a child care provider, safety was always my number one concern and when I recently overheard someone discussing a summer camp for children that encouraged them to take risks, I involuntarily and visibly cringed. I also recently had an “Aha!” moment as a parent when my son did a report for school that said the main behavior that made me happy was him being safe. In a previous blog, I discussed that I never sat in a chair but stood a post and while I still stand by the choices in protecting the children entrusted in my care, even my own, to the very best of my abilities, I question whether if I could have done a better job of protecting yet empowering them. Have I taught them to be safe or to be afraid? Was my helping, even with the best of intentions, inadvertently hindering them? As an adult, I fully recognize the need to take calculated risks. So why can’t we guide the children in our care to consider deliberate, advantageous risks in the right parameters, while still under our watchful yet embracing eye? 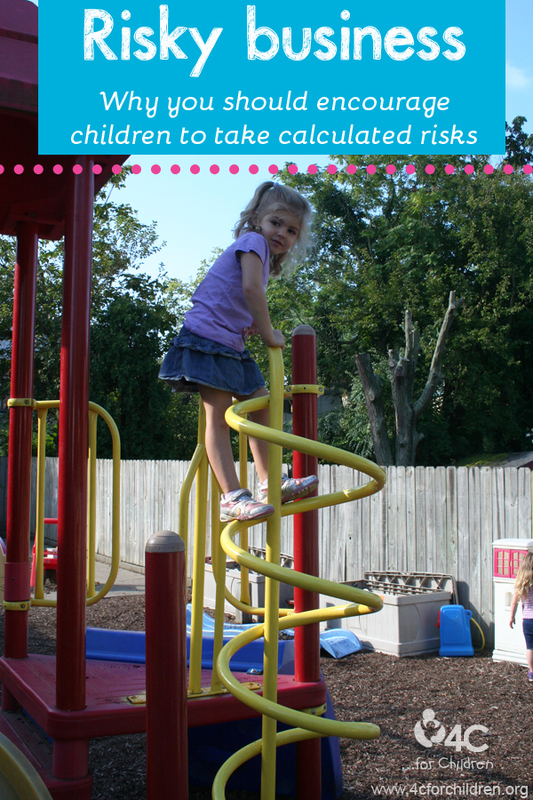 Healthy risks such as going down the big slide, jumping from a step from a safe level, using scissors to perfect their project, walking ahead to explore or using a butter knife to prepare their bread are all developmental learning opportunities. You aren’t letting them go in an unsafe way, you are letting them grow. You are giving the gift of freedom instead of fear. And yes, as I watch my sixteen-year-old son pull our car out of our driveway on his own, I am saying these things to myself as well. While it isn’t easy, I know and value the lessons of teaching children to chase their dreams while being careful not to clip their wings in order to prepare them for “flight” in life. This entry was posted in Best Practice, protecting children, teachers and tagged risk averse, taking risks on October 1, 2014 by bdoverspike.